I turned 60 on a Tuesday. Who turns 60 on a Tuesday? I “celebrated” with Stouffer’s Macaroni & Cheese; consumed a quarter portion, then nibbled through a quarter more. It was my birthday, after all. I didn’t know I had a problem with gluten. I only knew I never felt quite right and my intestines never worked properly. No, 60 was to my life what 40 was to my vision. One can deal with contacts and glasses; but 60 can throw you right off the rails. I had already contracted Lyme disease at 52 … undiagnosed with that crushing illness for more than two years … and surprisingly managed to limp out the other side. Moving to Florida gave my bones the warmth I needed and fate (God) placed me squarely within bicycle distance of a true yoga studio. The kind that celebrates spirit along with motion, intent with alignment. Yoga helped me rise physically, a phoenix from the ashes. At 63, however, yoga is not an option; it is a necessity. Weeks away from it, you can nearly feel your body crumble. Last week my ankle gave out; it’s an old skiing injury, broken in 3 places in 1965. Thank you Cubco bindings. I nearly had to crawl up my stairs. Which, of course, leads one to wonder how long one can live alone in a place with stairs. My mother has no problem with stairs. Two years ago she did start having problems with math, computers, cooking, cleaning … and me. In two short years they had to close their antique shop because she couldn’t manage the accounting, let alone the taxes – and my stepfather was in no mood to pick up the slack. He told her they had to sell out, auction off. She was enraged. She started throwing tantrums; some at him, and some on the phone to me. A doctor friend told me that is senile dementia. We expect to lose our parents through death; not by circumstance. I finally yelled back in January. Thank God she hasn’t called back. I’m alone but not lonely – strong, but incredibly fragile. She was dragging me into her darkness. I had offered to help, but she needs none. I had offered to find them a place near me for the winters … but no. I now realize that accepting my offers would have been a confession of age and weakness. While I freely admit my own, they both chose to write me off, out of their lives. They’ve broken my heart; I am newly orphaned. I have been praying more, I have been meditating. I actually bought a comfortable bamboo sofa for my lanai; it’s the perfect place to commune with nature and achieve peace; but it’s not working. Freelance projects have been coming in, so I can afford to go back to yoga. My body is regaining strength and balance. During class the inner pain dissolves, but it returns in the morning. Every night I pray for my parents, loved ones and those who need it. Every morning I wake to near total despair. As if a guardian angel told me YOU MUST NOT FORGET! Somewhat unnerved, I groped around for a pen and wrote the numbers in my dream diary. As I started to wake, I decided to write why I was so sad. The words poured out as I let the straining pain off the leash. Sad over Mom & my stepdad. “How do you do that to someone?” How does a mother write off her only child? Sad that one of my clients is hiring kids who drop the ball and waste my best efforts. Sad that there is no man in my life – and that my most beloved female friend has surrendered to fear and paranoia. Sad that at this age it takes so much effort to stay mentally and physically functional. I’ve been doing that and my dreams are becoming more profound; suddenly strong enough to wake me up urgently repeating page numbers. Again, it registered. I have a profound connection with my ancestors; I have experienced “dream memories” where you know the weight of your apparel and feel of the soil beneath your feet. To know spirit is to know there is no death. OK. I felt a little better. Stronger. A little more connected. I went downstairs and made coffee; there was one last book waiting for me on the lanai. 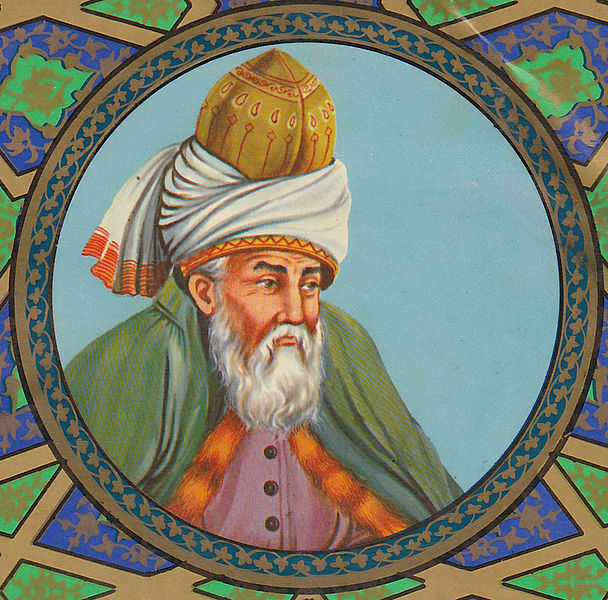 The Essential Rumi, Translations by Coleman Barks. Rumi was a 13th Century Sufi mystic and poet. His poetry is like dark chocolates, potent in tiny bites. And on page 273, I was filled with awe as the loving messages were brought full circle. I walk into a huge pasture. I nurse the milk of millennia. I hope these messages bring you the deep, long, cosmic hug they’ve brought me. I have a sense these messages were meant to be shared.